Carolina Nitsch is pleased to announce an exhibition of early and recent works by the collective Art & Language which will feature, for the first time in NY, their conceptual text PAINTINGS I from 1966 along with a new project titled These Scenes, 2016. Art & Language originated in 1966 at Coventry College of Art in England, from discussions between 4 teachers: Terry Atkinson, Michael Baldwin, Harold Hurrell and David Bainbridge. The earliest works probed the critical assumptions of mainstream modern art practice and criticism. Originating out of deliberations between members, the works are varied and resist easy categorization, but the central philosophy and dynamic was to give concrete form to the process of collaboration and discussion. The first issue of theArt & Language journal was published in 1969 and the group provided a common identity for other artists already involved in collaboration and conceptual art. By the 1970’s the collective comprised up to 50 artists, with a strong contingent in New York, whose relative anonymity has had historical influence. 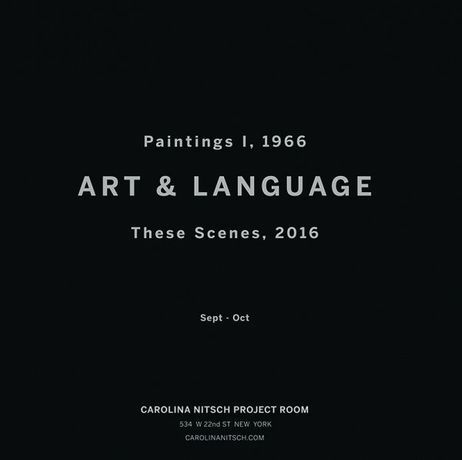 PAINTINGS I, 1966, predate the journal and are seminal to the history of Art & Language. These works originated as a certificate on letter paper which presents a text, and on the reverse, function as instructions to enlarge the text on paper to a specific size, which is then to be mounted on a wooden panel. The texts of PAINTINGS I are fragments cut out of the processes of conversations and learning between the members of Art & Language. The transcripts are unattributed and suggest authority, but because the source is vague and aimed at no one in particular they have an open ended position that extends beyond conventional art discourse. While called Paintings they clearly challenge the historical notion of what a painting can and should be - they are at the same time ideas and objects, texts and paintings. Five decades later, These Scenes, 2016, Art & Language’s newest project, is a mixed media portfolio of five different works, which investigates the history and social implications of Kazimir Malevich’s The Black Square, 1915. Malevich’s book, The Non-Objective World, 1927 had not been in English translation until 1959 and was eagerly read and discussed by many artists and historians in the early 60’s. When The Black Square was first shown, its radical approach ran parallel to the social upheaval happening throughout western civilization. Similarly, in the mid 1960’s, Art & Language came together during another period of social unrest and the writings and works of Malevich were naturally appealing to young artists aiming to challenge the established order. Discussions of this iconic and historically important painting have been, and continue to be, part of the dialogue among Art & Language members since the period ofPAINTINGS I. 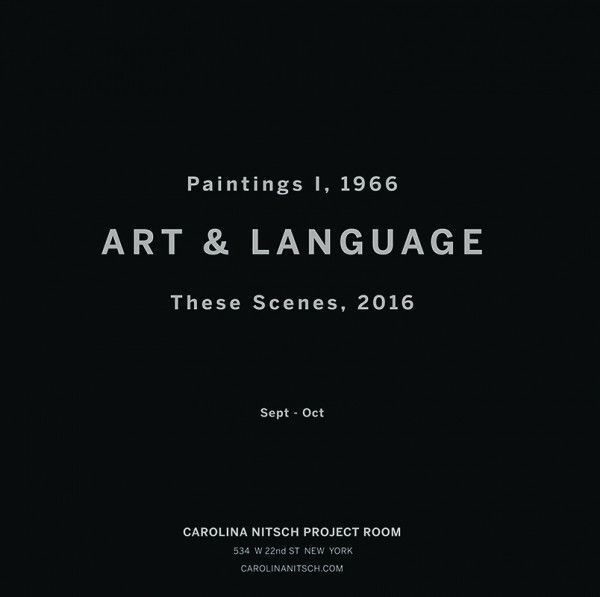 A survey of Art & Language editions from 1966-1971 will also be available for viewing.